What will Heaven be like? God is preparing a glorious kingdom for us. The purpose of this brief adventure you've got in this life is to determine eternity and yet, most people are willing and ready to sacrifice eternity for the passing temporary pleasures of this life. Welcome, again, to the Landmarks of Prophecy Bible study series, and tonight we're going to be studying a subject that you do find in the prophecies of the Bible dealing with the Kingdom of Heaven. More specifically, the lesson tonight is titled "The Magnificent Kingdom." and it's based upon a story that you find in your Bible with the experience of King Solomon. Now, when you look at the history of Israel, they had their ups and downs. But if you were to pick a point during the history of Israel when they had the highest glory, it would be during the time of King Solomon. In particular, when the Queen of Sheba came, because it tells us that the goal that God had for His people, He said, "I want you to be a nation of kings and priests. I want all people to come to you and to learn of Me." The temple had just been built, everything was brand-spanking new. Solomon had just built his house. There was great wealth and prosperity. They had peace on all their borders and, during that time, the Queen of Sheba had heard about the wisdom of Solomon. She came from a very wealthy country down somewhere near Saudi Arabia with a great caravan brought animals and gifts and all these treasures to Solomon and all she was asking for, she said, "I want to ask you questions" because the most important thing to her was truth and wisdom. She purely wanted to see, who was the God that Solomon worshiped. Have you ever heard the expression, "I had a breathtaking experience"? That comes from the Queen of Sheba. After she saw Solomon's house, and the temple of God, and the seating of his servants, and their apparel, and the wealth of the kingdom, and heard his answers for all the questions, the Bible says there was no more spirit left in her. We learned what that word means. She was left breathless. That's what the word 'spirit' means there. She was left, it was breathtaking and she said, "Surely the half was not told me of your wisdom and your greatness." And so, in this story we sort of have an allegory of the glorious, magnificent kingdom that God is preparing for us. I want you to listen to this lesson tonight, use a little faith that think bigger than just the here and the now. Bible has a lot to say about Heaven and it's very real. Let's look at some of the verses. Question number one in our lesson. What did Jesus promise His people? What did Jesus promise His people? In John 14:2, He said, "In My father's house" and you can say it with me "are many mansions. I go to prepare a place for you." and He said, "If I go and prepare a place for you, I will come again and receive you unto Myself." Hebrews 11:16, the Bible says, "For He has prepared for them" What? "a city." Now, when I think of cities, I don't think, usually, good things. You know why? People struggle with sin and selfishness and wherever you have a concentration of people, you're going to have a concentration of problems. Where do you have the gang problems? Not so much out on the farm, it's in the cities where you've got the concentration of people. And cities in Heaven will be different because there's no sin problem, there's no selfishness. Instead of it being a concentration of selfish people, it'll be a concentration of loving people. It'll be a great thing there. So I had to kind of revise my thinking about cities when I read that God has prepared a city because I used to run the other direction when I thought about cities. Revelation 21:2, "I, John, saw the Holy City, the new Jerusalem, coming down from God out of Heaven." Now here's a picture of the old Jerusalem, and do you know the city that's probably had more wars fought that has been destroyed and rebuilt more than any other city in the world is a city called the City of Peace. You know, that's what Jerusalem means, jeru city, shalom peace, jeru-shalom, city of peace. It's first mentioned in the Bible with a king, the first king of Jerusalem is not David, or Saul, or Solomon, it's someone named Melchizedek, who the New Testament tells us is a type of Christ. He was a king of righteousness. He brought out bread and wine for Abraham. Jesus is our king of righteousness. He was called the Priest of the Most High God. Jesus is our King, He's our Priest, he's our King of Righteousness. He brings us the bread and the wine, that's in the last supper. And Melchizedek was the king of a place called Salem or peace. Probably was peaceful back then, but once they started building up the city, there were more… you walk around the old Jerusalem today and you can see bullet holes in the walls, in the buildings still everywhere, they have not been repaired. Just a little chip pit marks from the wars that have been fought. But it's not the old Jerusalem that's coming down from Heaven. And some people say, "Oh, Doug, you know, how can you take this seriously? Pie in the sky by and by, these stories about Heaven, you Christians need… it's just a crutch for your weakness. You need to live in the here and now.” You know, but those same people have no problem believing that man can make a space city. Isn't that strange? Does anyone now doubt that we can put at least a little city in space? Isn't that what we have with the International Space Station? So the world laughs when we talk about Heaven but, you know, God takes it very seriously. God doesn't blink or flinch when He talks about Heaven. He said it's real. So when God says, "I’m going to bring this city down from Heaven" these dwelling places. People watch Star Trek and think, "Oh, could be true." you know, all these Trekkies out there that believe it. But God says it and so, "Oh, not so sure God can do it. Hollywood can do it, but we're not sure about God." I think He can. What more do we know about the Holy City? We're going to look at a number of details that tell us about Heaven and what's going to be happening there. Revelation 21:10 and 12, it says, "The holy Jerusalem, descending out of Heaven from God, had a wall great and high, and had" What? "twelve gates." Now 12 is a perfect mathematical number really for building. Why do we have a foot with 12 inches? Because it's one of the most perfectly easily divisible numbers. Twelve is divisible by 1, by 2, by 3, by 4, by 6 and God, in building the city, used perfect arithmetic. Twelve is a number that represents the church. There are a lot of unusual numbers. How many tribes of Israel? Twelve. Twelve. How many apostles? Twelve. Twelve. And the Bible tells us that the new Jerusalem has 12 foundations, 12 gates and you know what it says the gates are made of? You've heard the expression 'pearly gates'? It doesn't mean that they're inlaid with mother-of-pearl. The Bible says that each gate is a pearl. Now when you look at the dimensions of the city, if one wall is 375 miles and it says the walls are 144 cubits or over 200 feet thick, not quite sure how high they are. There's one verse that says, "The length, the breadth and the height are the same." One of the gates would need to be pretty big. That'd be a pretty big pearl. You're saying, "Pastor Doug, I can't imagine that." Don't worry, the Bible says you can't imagine the things that God has prepared for those that love Him. So as we go through this study and say, "Oh, that's too far-fetched. I can't imagine that." That's exactly what Jesus said, "You can't even imagine it." And if the pearls were that big, think about how big the oysters have to be in Heaven. Right? And then you can read in Revelation 21:21, "The street of the city was pure gold." Now I’ve heard that gold, if it was, if they could make gold absolutely pure, it would be transparent. That what gives gold the color is the varying degrees of impurity. And about 14 karat is about as pure as we can get it. But and then, you know, we've got 22 karat and various forms of gold, but here John is saying this gold is, it's as if it's transparent, it's the purest form of gold in Heaven. What does the Bible say about the city's water supply and its food supply? I get so excited talking about this study. It says in Revelation 22:1, "He showed me a pure river of water of life." All life needs water, animal, plant, fungus, mushrooms, bugs, whatever it is, there's no life. Bacteria cannot live without water. And in this world, the source of all life is going to be this water. Jesus said, 'I am the Water of Life." And first we must accept that into our lives. But from the throne of God flows this river. Now, I’ve seen the Nile, I’ve seen the Amazon and the Mississippi, and a number of the major rivers of the world and, do you know, at its mouth, the Amazon river is like 50 or 100 miles wide where it enters the Atlantic ocean. How big do you think this river is? When you picture the river that irrigates the whole planet, the main river, that's supplying the water to the planet, you better think big. It is going to be enormous. Furthermore, on either side, Revelation 22: 2 "On either side of the river, was the tree of life, which bear 12 different kinds of fruit. It yields her fruit every month, and the leaves of the tree were for the healing of the nations." This is a tree that every person alive on the planet needs to eat from. All the saved need to eat from this tree. And I think that the branches not only grow together above the tree, above the river, I think the roots may touch under the river and the river actually runs through it because it's one tree on either side of the river. How else do you, and they've looked at this in every translation, it says the same thing. One tree on either side of the river, the river runs right through it. It's a massive, massive organism, and we'll all gather, it says the leaves of the tree are for the healing of the nations. What's that mean? Are people going to get sick in Heaven? Have to run to the tree and rub it in their wounds? No, there's no sickness there. It doesn't say the leaves of the tree are for the healing of sickness. It says the leaves of the tree are for the healing of the nations. You know, we're all divided in this world by… there's political divisions, cultural, racial, language divisions, but when we come together as one family under the glittering leaves of that tree, all the divisions and distinctions are going to be healed, and there's going to be a unity there as we all have to reach out together and take from that tree of life. Don't go anywhere, friends. In just a moment we'll return to today's presentation. If you're anything like me, you're reluctant to turn on the evening news and to hear about the never ending evil, suffering, and misery in our world. We all long for world of peace, security and joy, where you don't have to constantly worry about death and dying. But is such a life even possible? You better believe it. And it's not just some fantasy, it's real. And what's more, you can be assured a place in that kingdom. 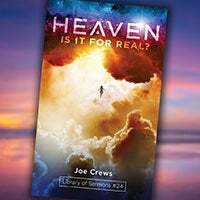 That's why Amazing Facts wants to send you a special free resource called, "Heaven, Is It for Real?" Not only does it show from the Bible what Heaven will be like. You'll learn how to be sure you're there. It even answers some of the biggest questions about Heaven, such as, will we recognize each other in Heaven? And what kind of bodies will we have? Flesh or spirit? Friends, with all the bad news in the world today, you're gonna really enjoy discovering all the wonderful things God has in store for those that love Him. To get your free copy, call the phone number on the screen and ask for offer number 189, or visit the web address. And after you read this incredible resource, make sure and share the encouragement with a friend. Well, let's get back now to today's presentation and learn some more amazing facts from the Word of God. How will the living in Heaven be different from here on Earth? All right, we're going to go through several things that are very exciting. A, and these are kind of A, B, C. Answer A: The eyes of the blind will be open. Won't that be wonderful? Some people maybe who have never seen, they're all going to have perfect vision then. You'll be able to see like an eagle. See, anything you've got in this life is going to be maximized in Heaven. All your senses will be infinitely more acute. And I think that they'll actually be enhanced. People who've always struggled with eyesight here are going to have the best eyesight there. People maybe who have struggled with hearing here, it says the ears of the deaf will be unstopped. And it says in Isaiah 35: 6, Answer C: "Then shall the lame man leap as a hart." Not just walk a little bit. You remember when Peter and John healed this crippled man at the Beautiful Gate in Acts chapter 3? It says, he went into the temple of God, jumping, and leaping, and praising God. He went from being crippled to leaping and he was so excited. All of your senses, all of these things will be, and then it says, and the tongue of the dumb will not just talk but they will sing and they'll have beautiful voices. I’ll be able to sing. Oh, I’m looking forward to that. Answer D: Isaiah 65:25, "And all the creatures there," there'll be animals there. How many more were there before the problems of man and before the flood? There'll be many more varieties. And will they hurt each other? No. You want to hear an amazing fact? See, you ever… you've heard of the Wizard of Oz and they sing "Lions and tigers and bears, oh my!' Well these three in this picture here, they call them BLT. BLT stands for bear, lion, and tiger. They were rescued from a drug dealer in Atlanta, kept them as cubs in his basement. It was a filthy condition. They were rescued. They were adopted by an animal park in Georgia. Because they were so used to being with each other, they put them in the same enclosure and they all get along just great. You ever wonder what would happen if a lion and a tiger and a bear got together? Well, if they know each other from childhood, they can do okay. And that's why the Bible tells us in Isaiah chapter… and this is answer E in your lesson Isaiah 11:6, "the wolf will dwell with the lamb, and a little child will lead them." You can see a little child leading a lamb, but a little child leading a lamb and a wolf? And it says that the lion will eat straw like the ox. How many of you ever read that book, it was out years ago about Little Tyke? Any of you know what I’m talking about? Raise your hands, Little Tyke? This family had adopted a baby cub. Its mother actually was killing all of her cubs and so they took it away from the mother at the zoo. They gave it to this family the Westbeaus in Northern California, and they adopted it, and they gave it milk. And once it got past milk, they tried to give it meat, it would not eat meat, but it gravitated towards grain. And this lion just refused to eat meat. It would play with lambs and the family pets and it would never bite or hurt anything else on the farm and it never in its entire… it grew to be a massive full-grown lion, it never ate any blood, any meat, it was a vegetarian lion. How many of you have heard that story? You can look it up, Little Tyke is the name of the book. It's an amazing story. Answer F: it says, "The desert shall blossom like the rose." You can find the most desolate places in the world now and there'll be a beautiful garden there. You know, now we have places that are just, they look like they're scorched earth, but not in Heaven. The beautiful places will be infinitely more beautiful and the deserts will still be beautiful. But the colors that you see now are nothing compared to the colors. If we could be taken in vision right now to Heaven, if we could endure it, if we could handle the glory of it all and how spectacular it is. If you could hear the strains of angels singing. If you could taste how much better, infinitely more delicious the food is going to be. Whatever your senses are, multiply that a hundred times. Everything has become dull in this life because of sin. It's all going to be enhanced and it will be that way for eternity. Furthermore, Answer G: Isaiah 33:24, "The inhabitant shall not say, 'I am sick.'" Nobody will be sick there. Won't that be wonderful? Don't have to ever worry about your health plan in Heaven or your health insurance. Answer H: Revelation 21:4, "There shall be no more death, neither sorrow, nor crying, for the former things have passed away." What you get there, you get forever and you never have to be afraid of losing it again. And yet, people are, they're reluctant. They hesitate being willing to give their hearts to Jesus and to follow Him. Number 6: What kind of bodies will the saints have in the kingdom? Are we going to be ghosts floating around? Philippians 3:20 and 21, "The Lord Jesus Christ, who will change our vile body that it might be fashioned like unto His glorious body." The Lord is going to give us a glorious body. When Jesus rose from the dead, was He real? You remember? He came forth from the grave, He appeared to the disciples, and there in the upper room He told them, Luke 24:39, He said, "Behold My hands and My feet, that it is I, Myself. Handle Me and see, for a spirit hath not flesh and bones as you see Me have." what is He saying? He's saying, "I am not a ghost." and then He ate in front of them to prove that He was real. What kind of bodies will we have? Real bodies, but we get four dimensions. See, right now we live in three dimensions. After Adam and Eve sinned, they lost a whole dimension, the spiritual dimension. That will be restored and we will have these glorified, eternal bodies. We'll be able to talk to the angels, we'll see God, so we'll be in tune with the spirit world at that point, the good spirits, the angels. What other encouraging promises are found in God’s word regarding this magnificent kingdom? It says in Acts 3:20 and 21, "And He will send Jesus Christ, whom the Heavens must receive until the times of the restitution of all things." That means everything is going to be restored. Now here's a question, friends. How many of you want to be in that kingdom and follow Jesus there, then? If you're going to follow Him there then, you must first follow Him here now. That's it. Those that follow Him here now will be able to follow Him there then, you can't make up your mind at the last moment. You want to be a Christian after probation closes, God’s calling you now. Will sad or painful memories from this life trouble people in Heaven? Answer: Isaiah 65:17, it says, "The former things will not be remembered nor come into mind." We won't have to worry about the former. I don't know about you, even while I’m standing here, I can think of things that I just, whenever I think of I just cringe. "Oh, did I say that? Did I do that? Oh!" Or painful things you've experienced you wish you could forget. Some people have experienced violence and things that just have caused all kinds of stress, soldiers, and you think, "Will I have those terrible memories forever?" God says, He'll heal us. All the beauty, and the glory, and the splendor, and the wonder, and the pleasures of Heaven will eclipse and displace all the painful memories of this life and there'll be pleasures at His right hand forevermore. What other thrilling promises does God give us regarding His coming kingdom? A number of things here we're going to look at. Answer A: in Isaiah 35:10, it says, "The ransomed of the Lord shall come to Zion with songs and everlasting joy." God is a loving Heavenly Father and the Bible says, He will withhold no good thing, no good thing from those that walk uprightly. He will not want to keep anything good from you. At His right hand are pleasures forevermore, but you'll never find the pleasure unless you do it God’s way. Oh, by the way, I just jumped ahead to our next verse. This is my wife's favorite verse, Psalm 16:11, "At His right hand are pleasures forevermore." Pleasure is not a bad thing. God wants you to enjoy pleasure. He gave you all the senses. He wants you to be blessed by your food. But, you know, in the world we spin it around backwards. We think we're supposed to go for the physical selfish pleasures first and then we suffer with the hangover all day. Answer C: Zechariah 8:5, "The streets of the city will be full of boys and girls playing in the streets there." You know, here in some of our cities, we're pretty scared. My mother used to let my brother and I play on 42nd and Broadway, it's hard to believe now. But in Heaven, will there be anything to be afraid of? You'll tell your children, "Go play in the street. Go play in the golden streets." They'll have nothing to be afraid of out there, right? No one's going to hurt them. Answer D: Isaiah 40:31, it says, "They will run and not be weary, they will walk and not faint. They'll mount up with wings like eagles." Will we be able to fly? Yeah. It talks about, you know, that song, Rock of Ages? "I’ll soar to worlds unknown," of course, that's a song. But I believe, it says, we'll mount up with wings like eagles, I believe we'll be able to fly. What is the highest reward of God’s new kingdom? Oh, this is the most beautiful part. It tells us in Revelation 21:3, "God Himself will be with them." Won't that be something? The Bible says that "From one new moon to another and one Sabbath to another shall all flesh come to worship before Me." We'll be able to worship before Jesus. He'll be the preacher and nobody will fall asleep during the sermon when he's preaching, right? And we'll know that everything He says is good and true. God himself will be with Him, we'll see Him. What will exclude people from God’s Heavenly kingdom? This is where it gets serious. Revelation 21:27, "There shall in no wise," that means in no way, "enter into it anything that defiles." That means that if there's anything defiling or sinful, it doesn't go in. The Bible says that Satan was cast out of Heaven for sinning. Heaven is a pure place, it's the presence of God. We must be purified now and prepared through the blood of Christ, to live in that kingdom. So we can't wait till Jesus comes for Him to transform us. Now is the time for us to become new creatures. The Bible says that today is the day. The Lord can give you a new heart. Old things are passed away when you're converted, all things are made new. It's often called "the new birth," and we need to be born again now. Revelation 21:7, "He that overcometh," That's the King James way of saying, "He that overcomes." Seven times it says, in Revelation chapter 2 and 3 "To him that overcomes. To him that overcomes." Overcoming what? We're all held captive by our sins, and through the power of Christ we can be transformed and be new creatures. It is possible. All things can happen through prayer. You spend time with Jesus, you fix your eyes on Jesus, you think about these things and it starts to become part of you. What did Jesus say is the formula for success in this life and in the life to come? Matthew 6:33, you know this, it's where we started. "Seek ye first the kingdom of God and His righteousness, and all these other things will be added." Solomon, when he loved the lord, he prayed, "Lord, give me wisdom." He prayed for God’s kingdom. He prayed for God’s righteousness. God said, "Because you sought this first, I’m going to give you everything else. I’m going to give you the wisdom, I’ll give you long life, I’ll give you prosperity, but seek first My kingdom." And that was the key, and it's still the key today. If you make God, knowing God and sharing God, living for Him, living for others your priority, He's offering you that wonderful kingdom. Don't forget to request today's life changing free resource. Not only can you receive this free gift in the mail, you can download a digital copy straight to your computer or mobile device. To get your digital copy of today's free gift, simply text the key word on your screen to 40544. Or visit the web address shown on your screen and be sure to select the digital download option on the request page. It's now easier than ever for you to study God’s word with Amazing Facts, wherever and whenever you want and most important to share it with others. What if you could know the future? What would you do? What would you change? To see the future, you must understand the past. Alexander the great becomes king when he's only 18. But he's a military prodigy. Hundred and fifty years in advance, Cyrus had been named. Rome was violent, they were ruthless, they were determined. This intriguing documentary hosted by Pastor Doug Batchelor explores the most striking Bible prophecies that have been dramatically fulfilled throughout history. Kingdoms in Time. Are you ready?